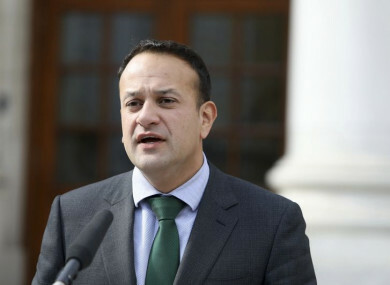 AN TAOISEACH LEO Varadkar has said that he will campaign to liberalise Ireland’s abortion laws. In an interview with the BBC, Varadkar said he was in favour of changing Ireland’s abortion laws. This is the first time he has given his public opinion on the matter since the Oireachtas Committee on the Eighth Amendment delivered its final report late last year, recommending that it be removed from the constitution. The Eighth Amendment grants the equal right to life of the mother and the unborn child – effectively making abortion illegal except in very limited circumstances. Varadkar was speaking ahead of a special cabinet meeting scheduled for Monday in which the terms of the proposed referendum will be discussed. “I’ll be campaigning for them to be changed and to be liberalised, yes. “As I’ve said on many occasions I believe Ireland’s abortion laws are too restrictive and need to be liberalised. We do however unlike other countries have a constitutional ban on abortion, in our constitution and the only way we can change our constitution is by referendum so we will have that referendum hopefully this summer and we should be in a position to make a decision on it in government next week. Varadkar was also questioned about when he changed his views, as he had previously said in the Dáil that he was against abortion. “I suppose in that period [since 2014] I think it’s fair to say my own views on this matter have evolved but I think some of those terms pro life and pro choice can be misunderstood,” he said. Even people who are in favour of abortion in certain circumstances are pro life, you know I still believe in life but I understand there are circumstances in which pregnancies can’t continue and I don’t think it’s the role of the state to essentially criminalise people. Varadkar was pressed on whether he would call himself “pro choice”. “Again what do those words even mean? Every single person I know who says they are pro choice believes in some sort of restriction,” he said. “They don’t believe in late term abortions for example up to 38 weeks. “These terms pro life and pro choice don’t really comprehend the complexity of this issue. Which is a very private and personal one and on I think that contains a lot of grey areas. I think even people who are in favour of abortion in certain circumstances are pro-life. I still believe in life. I understand there are circumstances under which pregnancies can’t continue. A spokesperson for the Taoiseach said that he was asked the question about his views in an interview yesterday and gave an answer. Some commentators have expressed confusion that the Taoiseach decided to give his views and stance on the matter for the first time to an international outlet. It is expected that Varadkar will set out his full views on the matter – around whether he backs a straight repeal – following the special cabinet meeting on Monday. Fianna Fáil leader Micheál Martin confirmed last week that he was in favour of repealing the Eighth Amendment. Martin said he arrived at the decision after a “long period of reflection“. His stance is at odds with many members in his own party. Email “Leo Varadkar says he will campaign to liberalise Ireland's abortion laws ”. Feedback on “Leo Varadkar says he will campaign to liberalise Ireland's abortion laws ”.